A dairy farmer and meat proponent, T. Colin Campbell traveled the world feeding hungry people with meat, dairy and eggs (the S.A.D. diet ~the Standard American Diet). He studied the effects of the food he shared. In his five decade study, with millions of people of all different ethnicities, cultures and body types, he found that the more meat, dairy and eggs he fed them, the more they came down with all the major and minor diseases (cancer, heart disease, stroke, diabetes, obesity, kidney and liver disease, impotence, osteoporosis, etc) and conversely, the less he fed this fare, the healthier they became. Longevity is another factor in health. John Robbins, author of The Food Revolution: How Your Diet Can Help Save Your Life and Our World, went around the planet and visited various societies. He found the four longest living ones, the Abkhasia in the Caucasus south of Russia, the Vilcabamba in the Andes of South America, the Hunza in Central Asia, and the southern Japanese islands of Okinawa, the modern Shangri-la and wrote about them in his book, Healthy at 100. 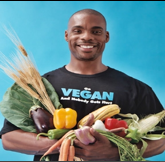 Here, he describes how these people live on a vegan diet till age 125 and 150, still active, energetic, and important participants in their communities.